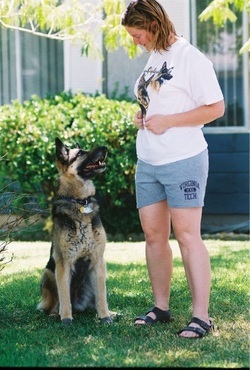 The Good Shepherd Dog Training was started by Veterinarian Regina R. Allen DVM in 2011 to teach owners and their dogs competition obedience and agility skills in a positive, dog-friendly training environment. Classes utilized clicker training and shaping to encourage and reward desirable behaviors, and cultivate self-control and enthusiasm for work by the dog. I regret to inform everyone that The Good Shepherd Dog Training is now closed. Thank you for your loyal patronage over the years. My book, "Click Your Way to the Canine Good Citizen" is available through Amazon.com in both hard copy and Kindle format.